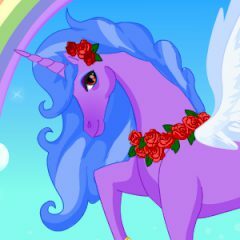 Unicorns are the most beautiful and marvellous magical creatures! They are so nice and graceful. This unicron lives in the magical rainbow kingdom. Dress up this wonderful animal. You can choose the color of his skin, his mane, tail and hoofs. Enjoy!